PTS Zebra (Formerly Motorola) MC3200 Barcode Starter Kits are the next generation in the industry-leading rugged MC3000 Series, now upgraded to support your next generation mobile applications. 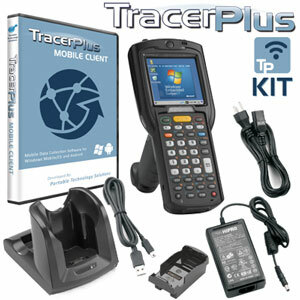 Pairing PTS' TracerPlus mobile barcode software along with the tough, tested and trusted MC3200 barcode terminal, these MC3200 kits take inventory management efficiency to the next level with more processing power, more memory, fast 802.11n wireless connectivity and support for two advanced mobile operating systems in Android Jelly Bean and Windows Embedded Compact 7. PTS recommends using MC3200 Barcode Kits for mobile applications including Retail and Warehouse Inventory, Asset Tracking, Order Picking and Work-In-Process.